Chennai Central–along EVR Periyar Salai–Vepery–Kilpauk Medical College–Aminjikarai–Shenoy Nagar–Annanagar East-Anna Nagar 2nd avenue–Tirumangalam–Koyambedu-CMBT–along Inner Ring Road–Vadapalani–Ashok Nagar–SIDCO–Alandur–St. Thomas Mount. The portions of Corridor-1 with a length of 14.3 kms. from Washermanpet to Saidapet, and Corridor-2 with a length of 9.7 kms. 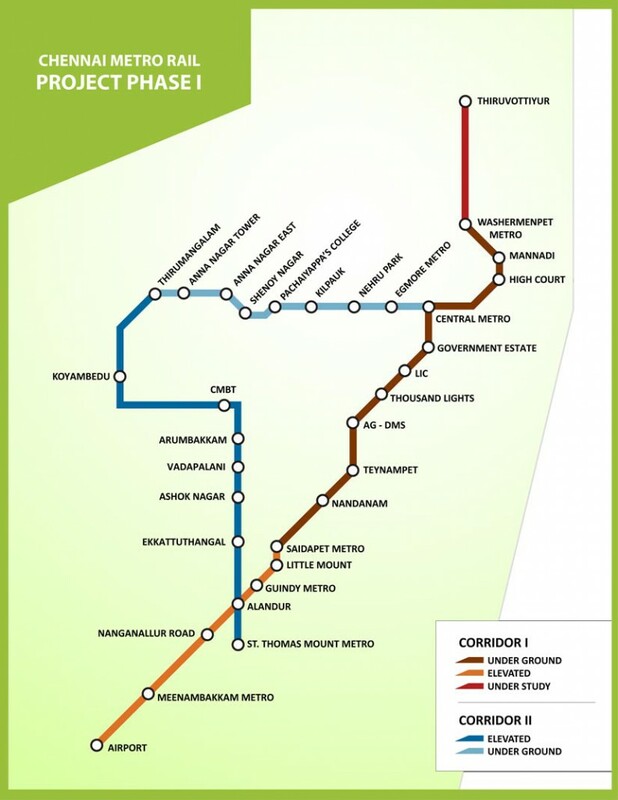 from Chennai Central to Anna Nagar 2nd Avenue will be underground and the remainder elevated. The alignment and stations given above are tentative and subject to change during detailed design and execution.